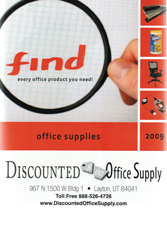 Whether your on a budget and want value or your looking for a luxurious bookcase to enhance your office environment, Discounted Office Supply has the bookcase you need at a discount price. We have a large selection of wood and metal book cases to choose from: 2-shelves all the way up to 6-shelves in many styles, sizes and colors. Bookcases manufactured by industry leading brands such as HON, Tiffany Industries, Basyx, DMI Office Furniture, Alera, Bush, Tennsco and Safco. Browse our collection of bookcases by choosing either wood or metal below.